Artis James (AJ) Prestidge was born in Fort Worth, Texas on March 16, 1988. He grew up in Arlington, Texas where he graduated from Mansfield Timberview High School and went on to major in Art at Texas Tech University. AJ loved to laugh, read, travel, play video games, and paint. His best friend and partner in crime was his sister Marie. AJ loved all kinds of music from hard rock, RAP, jazz to contemporary Christian. His favorite video game was Grand Theft Auto and his favorite movie was Pulp Fiction. He loved to eat sea food and drink his famous sweet iced tea. Artis was a 3-year participant of the Alpha Ambassador Club (AAC) advanced college preparatory program, sponsored by the, Alpha Phi Alpha Fraternity, Inc., Nu Pi Lambda Graduate Chapter where he was involved in many community activities. His involvement in this organization developed AJ’s passion to work with various volunteer organizations, political campaigns, and befriending those who were disenfranchised or ostracized. named Artis. He played the keyboard, guitar, xylophone, and drums. Artis started painting in the 8th grade and really developed his talent under the leadership of his favorite teacher David Mason. 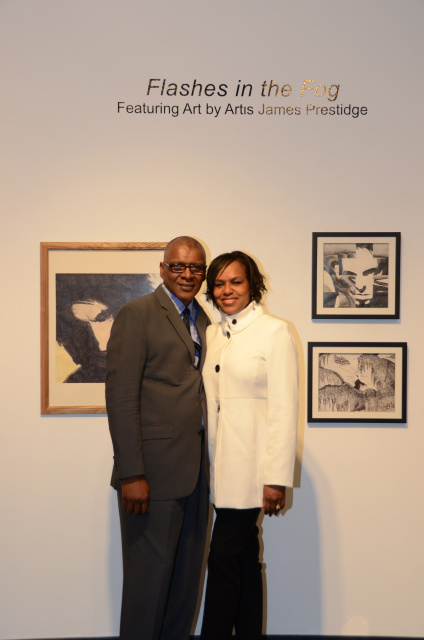 After the death of his beloved grandfather Artis Ray Prestidge, Sr., Artis began to express himself by painting, often all night long. Any feelings that he could not express in words, came out on the canvas. Along with his many competitions, his artwork was also displayed during a Ft. Worth Symphony Orchestra performance in 2007. His primary artistic influence was the artist Jackson Pollock an American painter and abstract expressionist. Artis the artist was a fun loving, gifted, talented, and kind soul.